BizInt Smart Charts for Patents can build charts from search results from PatBase. These instructions describe how to export Family data from Patbase. If you would like to export the individual publications from a family, follow the instructions on the linked page. Log on to PatBase, perform your search, and display results. Click on the "Save/export" link. 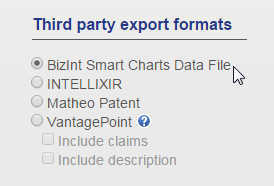 On the Export Search Results window, select "BizInt Smart Charts Data File" under Third Party export formats (left side of window.) You do not need to select of the other export options. If you want to have Notes or Ranking values exported to BizInt Smart Charts, you need to select those options on the export panel (bottom right corner of the panel). You can select the records to export; and then click "Export". Follow the instructions to save, open or have the .bpd file emailed to you.